Photo by Aisen Caro Chacin. Parsons Master of Fine Arts in Design and Technology student Aisen Caro Chacin says she makes work that dabbles on the cusp of science through interaction design, and devices for interfacing the body., So, in a way, it shouldn’t be a surprise that when she had to do a major project in her first semester (for Jonah Brucker-Cohen’s Major Studio: Interface class), she designed a grill, – a shiny mouth prosthetic that covers the teeth, popularized by early ’00s hip-hop artists ‘ containing a tiny MP3 player that plays music by vibrating the wearer’s teeth. On the other hand, it’s a grill that vibrates your skull to play music, which can’t help but be a little surprising. Perhaps that’s why her project has been so popular on technology blogs. Time, Gizmodo, and Popular Science are just a few of the outlets that have posted photos and videos of Chacin’s creation. 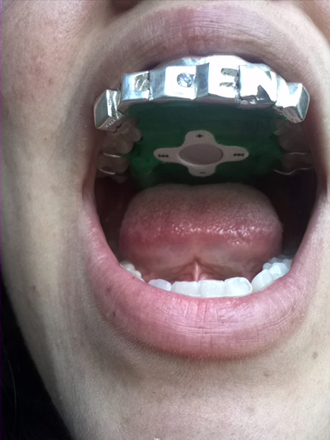 The secret is in a small motor inside the grill, which vibrates to the frequency of the sound, [and] when bitten your, teeth oscillate to the same frequency,, Chacin explains. Because your teeth are embedded in the jaw, which is very close to your ears, the inner ear bones also oscillate allowing the nerve to process this vibration as sound information., The grill also sports an old-school Nintendo directional pad that sits over the wearer’s palate, allowing them to change songs and control the volume with their tongue.